We are delighted to announce that our new e-commerce site, www.radonshop.co.uk is now live! Here you will be able to order radon test kits for home or workplace use, as well as a variety of digital radon monitors and mitigation equipment. Our Standard 3-Month Radon Test Kit contains two passive detectors which should be left in place for 12 weeks before being returned for analysis. All analysis is undertaken at an independent third-party laboratory, and the analysis and reporting is included in the cost of each kit. A 3-Month Radon Test Kit costs just £42.00 inc. VAT and delivery. If you need an indicative result sooner, you can purchase our 10-Day Radon Screening Test Kit. This kit also contains two detectors, but they need only be left in place for a minimum of 10 days before being returned for analysis. This test kit will give you an accurate result of the radon level during the test period, however, you should bear in mind that radon levels fluctuate constantly so it is always preferable to carry out a longer term test when possible. Whilst a test kit containing two detectors is ideal for most sized homes, if your property is very large, has a basement or has been extended you may require additional detectors. These can also be ordered through our online store, www.radonshop.co.uk. At the end of the testing period, you will need to return the detectors (and tracking form) to us for analysis. 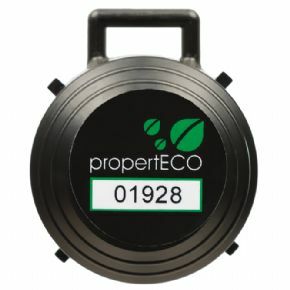 Results reports are usually emailed to the email address supplied on the tracking form within 10 days of us receiving the detectors. 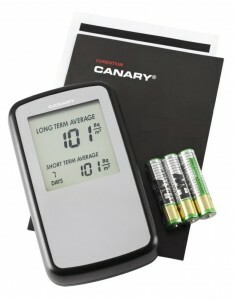 The Canary Digital Radon Monitor is available from our website www.radonshop.co.uk and costs £219.00 including VAT and Royal Mail Special Delivery.